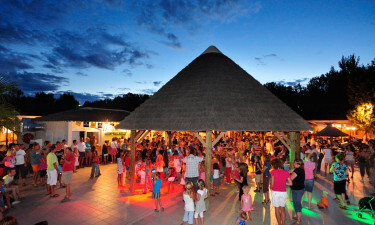 Domaine de la Yole holiday camping site is a popular family resort conveniently located near Valras Plage beach and town. Encircled by the lavish terrain of Languedoc vineyards, this traditional family favourite is a luxury camping site with an extra French twist. It has an exceptional choice of shops, bars and eating options plus it's not too far from a golden sandy beach. At LUX-camp, there's bungalow tent and mobile home accommodations to choose from so just give us a call today to make your booking. We kindly ask you to give us your registration number at least one week before your arrival (by e-mail info@lux-camp.co.uk or by telephone: 01506 674726). We must provide this information to the campsite so that they can create a barrier card for you before your arrival. What makes a Domaine de la Yole camping holiday different? Extensive and exceptional pool complex. Easy access to nearby beach and town. Wonderful array of things for the children to do. A traditional French bakery right on your doorstep. Domaine de la Yole has a waterparc and it's designed to entertain the entire family. There are four outdoor pools, two of which are heated, and they come equipped with a variety of fun water features. There's a lazy river, twisty and multiple lane chutes all set among swaying palm trees and filled with novelty fountain features and play apparatus. Sun loungers are available on the terraces. 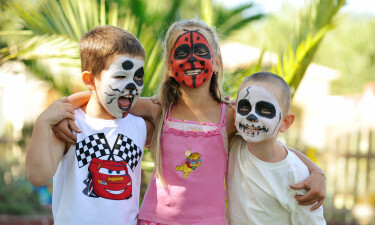 The kids will simply adore their luxury bungalow or mobile home amenities and Domaine de la Yole strives to deliver luxury camping with all the trimmings. The onsite children's club is well organized with a variety of tournaments, competitions, music and games to keep them on their toes from dawn till dusk. The animation team runs an aquagym and hosts talent competitions as well as a kid's disco. There is even evening entertainment, family-inspired, so no-one feels left out. 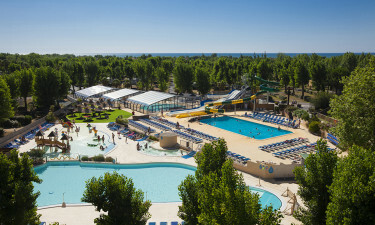 Valras Plage is only 0.5km from this delightful holiday campsite and the town of Valras is only a further 4 km away. There's a stack of water sports to participate at the beach as well as quad biking, boat trips and horse riding further afield. For a lovely family day excursion, why not head off to Cap d'Agde Aquarium, where you'll experience French marine life first hand. The kids will be enthralled by the 30 tanks that display fish from all over the world. Domaine de la Yole campsite comes complete with two of its very own restaurants; Le Comptoir des Saveurs, Le Restaurant de la Ferme. You can eat indoors or, for that touch of romance, enjoy a star-lit evening meal on the terraced seating, which is also available. There is a take-away onsite and two great bars to choose from so you sample some local French wines. You'll be spoiled for choice when it comes to stocking up on goodies as well as a wine shop and a gift shop for souvenirs. There's a supermarket as well as a bakery where you can purchase tasty daily, fresh bread and pastries.